Need an easy breakfast or brunch recipe? 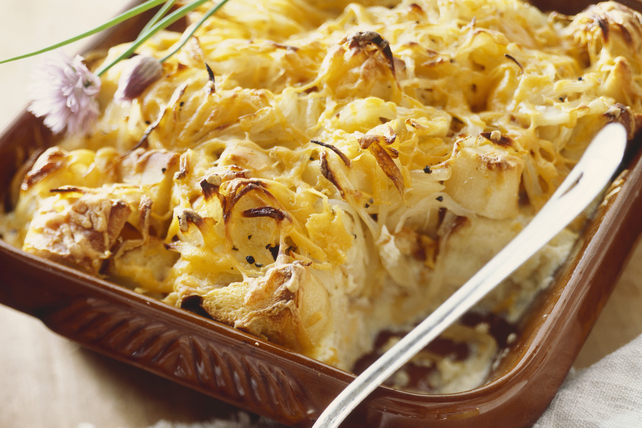 Our Breakfast Cheese and Onion Strata fits the bill. And since it can be prepared ahead of time, it's the perfect recipe for your busy lifestyle. Melt butter in large nonstick skillet on medium heat. Add onions; cook 10 to 12 min. or until softened and evenly browned, stirring frequently. Spread half the bread cubes onto bottom of 13x9-inch baking dish sprayed with cooking spray; cover with layers of half each of onions and cheese. Repeat layers. Whisk remaining ingredients until blended; pour over ingredients in baking dish. Cover. Refrigerate 4 hours. Heat oven to 350ºF. Bake strata, covered, 1 hour or until knife inserted in centre comes out clean and top is lightly browned, uncovering after 30 min. Let stand 10 min. before cutting to serve. This delicious strata can be refrigerated up to 24 hours before baking as directed. Garnish with chopped fresh chives or additional fresh thyme before serving.